The distaff caper film Ocean’s 8 easily topped the weekend charts with an estimated $41.5 million, but the overall box office was down almost 20% from the same weekend a year ago when Patty Jenkins’ Wonder Woman remained at #1 with a $58.5 million sophomore frame. But there are signs that things could turn around in a hurry—Jurassic World: Fallen Kingdom, which debuts here on June 22, opened in 48 territories, earning $151.1 million, which is more than Solo will make in its entire overseas run. Ocean’s 8 debuted ahead of expectations, and its success (along with that of Book Club), indicates that Hollywood might be getting the message that there is a sizable audience of female moviegoers that is just not being served, especially during summer “blockbuster” season. As might be expected women made up almost 70% of the audience for Ocean’s 8, which skewed older, with 69% over 25 years of age. 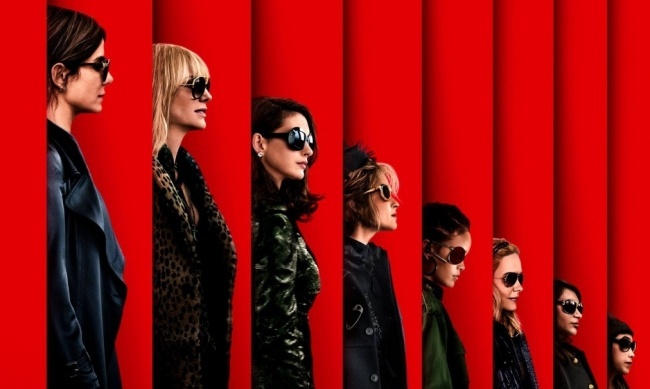 Ocean’s 8 received a “B+” CinemaScore from audiences, which bodes well for its prospects over the next few weeks as the competition heats up with the debuts of the highly anticipated Incredibles 2 next weekend and the Jurassic World sequel in two weeks. While the $70 million Ocean’s 8 is off to a great start, don’t get carried away. Technically Ocean’s 8 posted the “biggest” opening of any film in the modern “Ocean’s” series, but if you adjust for inflation the three Steven Soderbergh/George Clooney Ocean’s films debuted with $61.7 million (Ocean’s 11 in 2001), $57.7 million (Ocean’s 12 in 2004), and $48.1 million (Ocean’s Thirteen in 2007). Ron Howard’s Solo: A Star Wars Story dropped 48.8% and finished in second with an estimated $15.2 million, driving its domestic total to $176.1 million. Solo is doing even worse overseas where it earned just $11.3 million to bring its earnings outside North America to just $136.1 million with Japan the only market left. It is now painfully clear that Solo will be the first Disney Star Wars film that won’t recoup its production cost during its theatrical run (if ever). Part of the problem is the film’s bloated $300 million price tag, which was inflated by reshoots necessitated when the film’s original directors were let go in the middle of the production, and part of the problem was timing—forsaking the now traditional Star Wars Christmas release appears to have been a huge mistake, but Solo’s tepid box office performance indicates that there may be other serious issues that Disney and Lucasfilm will have to address to get their ambitious Star Wars program back on track. Everyone always complains about Hollywood’s infatuation with sequels (and Lord knows the studios are famous for going back to the same well way too many times), but look how audiences respond—this week’s number one film is a sequel, and the two highest-earning films in the top ten are sequels, Fox’s Deadpool 2, which came in at #3 in its fourth weekend of release, adding $13.65 million to bring its domestic total to $278.7 million and its global haul to $655 million, and Marvel Studios’ Avengers: Infinity War, which ended up at #5 in its seventh frame, adding $6.8 million to bring its domestic total to $654.7 million, and its global total to $1.998 billion. By this time next week Infinity War will become only the fourth film ever to cross the $2 billion mark. Sandwiched in between those megahit superhero sequels was a “buzzy,” critically-acclaimed horror movie, Ari Aster’s Hereditary, which boasts a gaudy 93% positive rating on review aggregator Rotten Tomatoes. Will Hereditary follow in the footsteps of A Quiet Place, Split, and Get Out— well-reviewed horror movies that managed to breakout and become $100 million-plus earners? Audiences may have thought so, as Hereditary opened with a better-than-expected $13 million, the best opening in mini-studio A24’s history. The problem for Hereditary is one that plagues many “arty” horror films—critics love them, but horror film audiences do not. Though it should be noted that horror movie fans are far less liberal with high marks than devotees of other genres, Hereditary, which attracted an audience that was 58% male and 75% under 35, received a lowly “D+” CinemaScore, which means that A Quiet Place remains unchallenged for now, as the big horror movie hit of 2018. 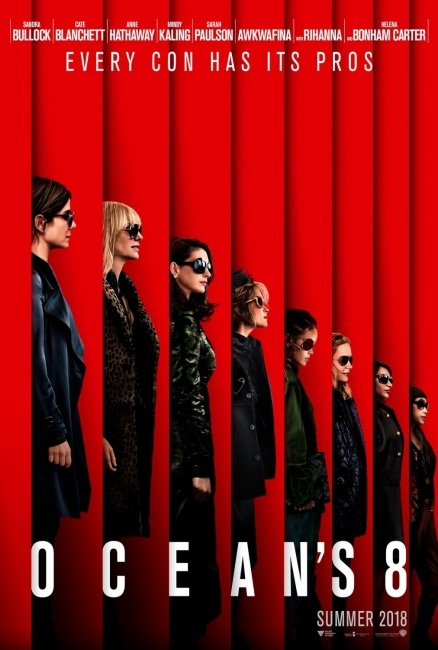 With Ocean’s 8’s strong appeal to female viewers (and Book Club’s continuing “legs”), the romantic adventure Adrift dropped 56.5% in its second frame, earning just $5 million, which is just a bit more than Book Club ($4.2 million), which is now in its fourth weekend in theaters, where it has earned $56.9 million. Drew Pearce, who wrote Iron Man 3, made his directorial debut in the crime feature Hotel Artemis, which in spite of its excellent cast (headed by Jodie Foster), bombed, earning just $3.2 million from over 2,400 locations. With a lousy “C-“ CinemaScore from opening weekend audiences that skewed male (54%) and older (63% over 25), Hotel Artemis’ fate appears sealed. In limited release, the Fred Rogers documentary Won’t You Be My Neighbor? averaged $16.2K from 29 locations, a solid start for the one documentary that appears to have a shot at catching the Ruth Bader Ginsburg doc RBG, which has earned $9.1 million, tops for a documentary film in 2018 so far. Be sure to check back here next weekend to see what happens when Disney/Pixar’s Incredibles 2 opens in over 4,200 locations, while Warner Bros.’ comedy Tag will snag screens in over 3000 theaters.